Brand new level in audio recorder apps – Voice Tape Recorder. Around you always somebody says something funny or you hear some unusual or pleasant for you noises and sound effects. And you want to remember it but your device recorder is too weak to save these sounds in high quality. Now, you don’t need to worry about it. Voice Tape Recorder will solve all your problems. *HOW TO USE*: First of all, tap on a REC button to record something. Red light indicator will show you that recording process starts. After that you can replay it to test. Then you can use a great collection of original noises and sound effects to add some creativity and make your recorded file sounds unusual! In the end don’t forget to save your audio file! Don’t let your simple recording apps ruin your memories! Voice Tape Recorder app will save it for you for a long time in a creative way! Narrator is the simple way for journalists, DJ’s, public speakers and business men to record, splice and piece together narrations, voiceovers or dictated notes. Compositions can be exported as audio or spliced together with existing video footage. Record and Playback up to 8 tracks of audio (16 with In-App). Import .MP4 or .MOV videos from file or your Camera Roll. Import audio backing tracks from your iPod music library. Built in audio editor for creating cuts, fades, or applying effects. Trim and Cross Fade facilities. Built in 16 channel mixer with volume, pan and 3 Band EQ per channel. Real time effects such as reverb, chorus, and delay are available. Audio Ducking of music and video soundtracks. Ability to manually control volume, pan and effects in real time. Create both time or music based projects. Share files to DropBox, Soundcloud, Email and other applications. Support AudioBus and Inter-App Audio. Supports the Pasteboard for copying audio between applications. Extensive list of additional effects available for In-App purchase. Supports FTP, WebDAV and iTunes File Sharing. Duplicate, Replicate and Clone clip functions. TapeRecord is a simple and unique recording experience. An homage to the days of reel-to-reel recording, TapeRecord allows you to record or import audio clips from any source and cut, paste and reassemble them to create new and unique audio pieces. Sing along over your favorite song or instrumental, add some beats on top your guitar session or simply record the sounds that surround you, TapeRecord can fulfil all you audio recording needs and add a lot of fun on top! TapeRecord also allows you to share your recording creations with your friends via SoundCloud, DropBox and Facebook. – Record audio on-the-go directly to your device. – Unlimited recording time (dependent on available space on your device). – Mix new audio on top of existing audio. – Add time-coded text notes to your recording. – Playback at any speed or direction (including backwards). – Record and combine audio at different speeds. – Microphone and Tape FXs, such as: reverb, delay, compressor, equalizer, stereo balance. – Cut, Copy and Paste audio clips from different sources. – Upload audio files of any standard format (through iTunes File Share). – Import songs and audio from your device’s local iTunes library. – Share your recordings with SoundCloud, DropBox and Facebook. 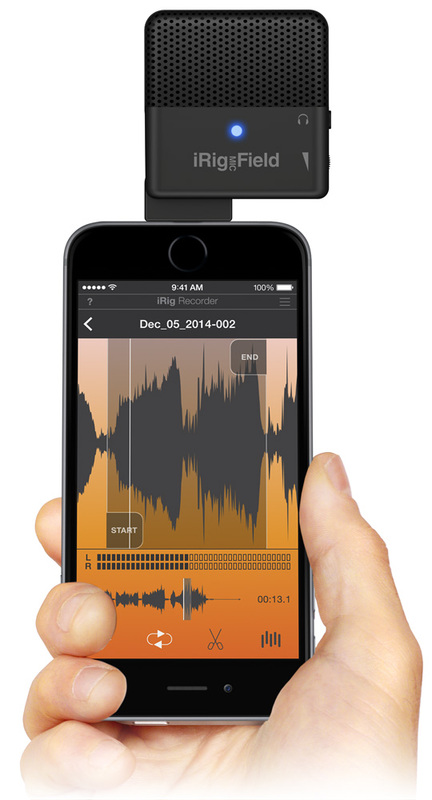 Turn your iPhone into a professional field recorder! Record high quality audio files and upload them immediately. Keep track of your recordings with the Roadcast organizer. + Reliable recorder for radio reporters and powerful dictaphone. + Multiple audio formats: WAV, MP3 or AAC. + Various quality settings to configure the bitrate etc. + Supported export services: Dropbox, Soundcload, FTP, E-Mail. + Beautiful waveform with zoom capability. + Simple VU meter with gain slider. + Clean design: The simple user interface makes Roadcast easy and fun to use. + Sophisticated upload manager allows multiple uploads simultaneously. New files can be recorded even when uploads are in progress. + Powerful organizer to manage recordings. + Auto Naming: Custom file name patterns can be set for the file export. + Works with your iPhone’s internal and external microphones. Optimized for the USB microphones RØDE iXY, TASCAM iM2/iM2x and many more. + Visual warning when limited memory is available showing the remaining recording time. + Roadcast continues recording even when running in the background or when the screen is switched off. If you’re not sure if you want to drop money on the Master’s edition of MixPad, try out this free version first! MixPad is a free multi-track recording and mixing software. You can access all the power of professional recording and mixing equipment through a single platform that streamlines the process and makes mixing a breeze.